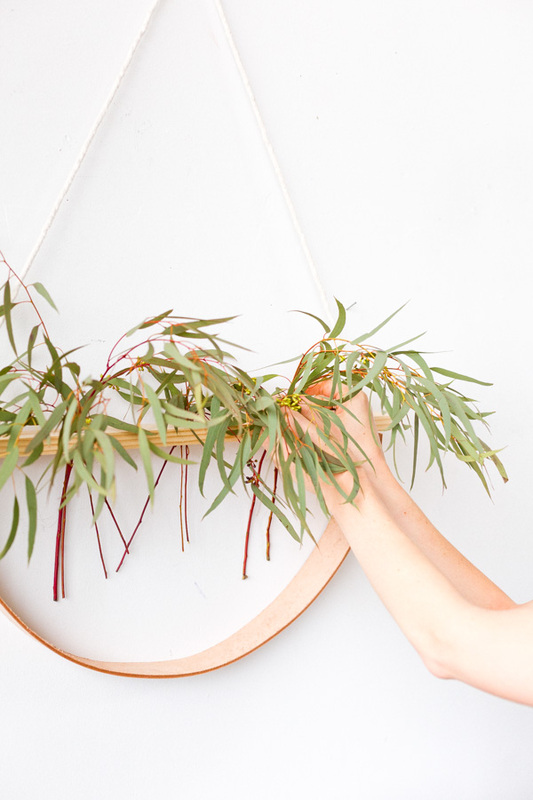 Inspired by an ever popular necklace style, I made a large scale DIY plant holder for eucalyptus, dried flowers, air plants, etc that hangs on the wall as a unique piece of art. It’s super affordable (under $15) and great for parties or as everyday decor. Plus, you can customize it to pretty much any size you want. 1. 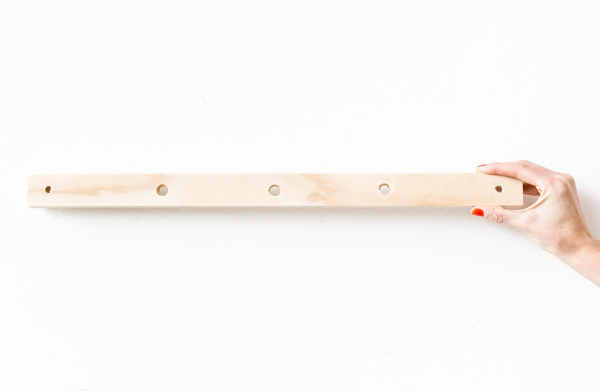 Start by measuring the holes for each end of the wood. Mine are spaced one inch from each end, in the center of the width. 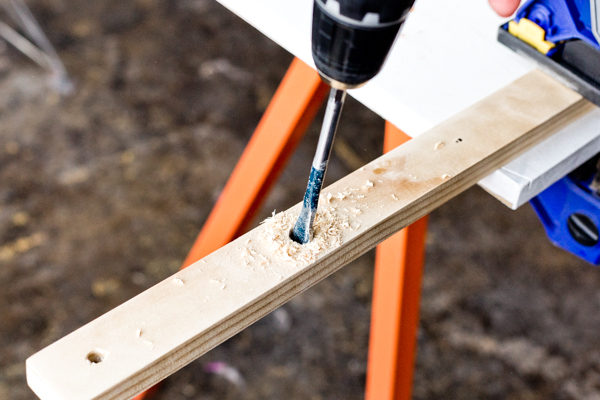 Then clamp down the wood and drill those two holes in your desired size. I used a 5/16 drill bit for this step. 2. 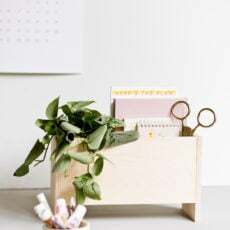 Then, use a 1/2 inch spade bit or a large drill bit in the same size to create the interior holes where the plants will rest on the wood when finished. I found that about 5 inches between each of these three holes works well for the length of the wood. 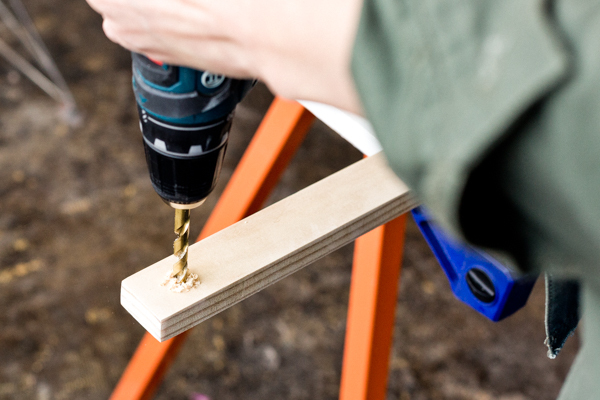 *Use a table clamp to secure the wood before drilling. 3. Next, remove that piece of wood from the clamps, and get out a piece of scrap wood. Clamp the long leather strip to the table and the scrap wood, as shown in the photo, and drill one hole on each end of the leather. I used a 5/64 drill bit for the two leather holes and drilled the holes 1/2 inch in from the end of the leather, which is slightly different than the wood from stye 1. Note: The scrap wood underneath the leather in this step acts as a solid surface underneath for safety while drilling. I know the scrap piece in the photo looks like the wood piece I used in step 1, but it’s actually a different piece. Just wanted to mention, so no one gets confused. 4. 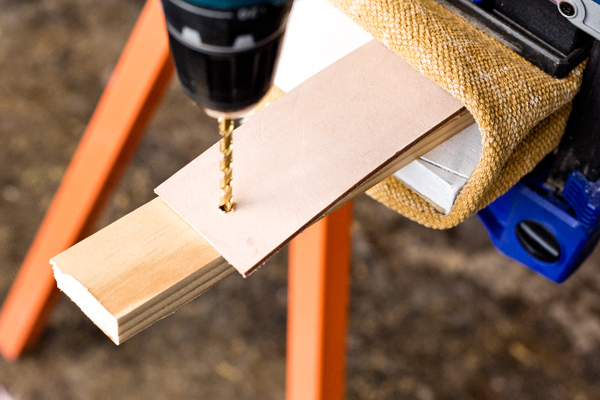 Use sandpaper to refine and smooth any parts of the wood that need a little work or have any wood splinters leftover from the drilling. 5. Tightly wrap tape around one end of the cotton piping to make it easier to get the piping through the hole, as shown in the photo. 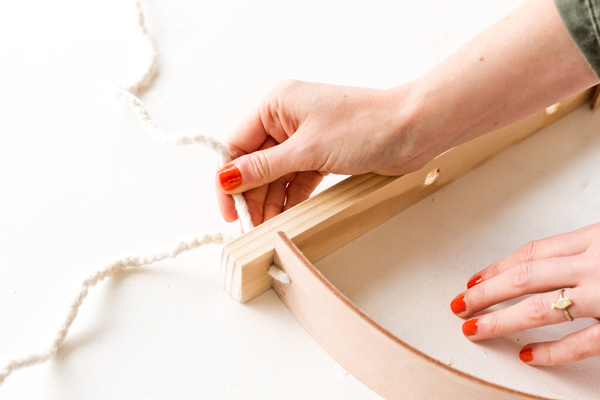 Then, poke the string through the top of the wood hole on the very end. Pull it through and bring it through the hole in the leather. Then bring it back through from the bottom of the wood to the top, as shown in the photo. 6. 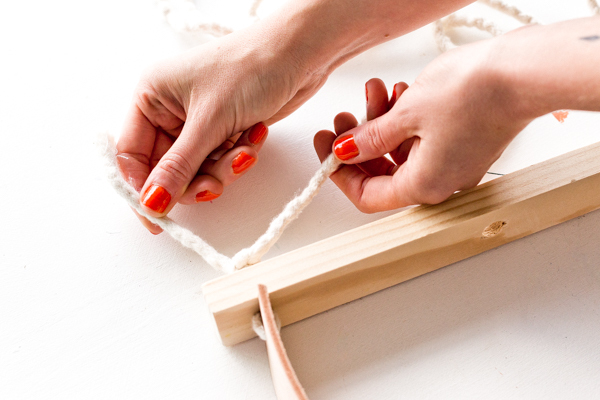 Triple knot it tightly to the hole on top of the wood and cut off any excess on one end, so you only have one long strand of cotton piping. 7. Repeat steps 5 and 6 with a second piece of piping. Then tie the two pieces together at the top and it’s ready to hang. 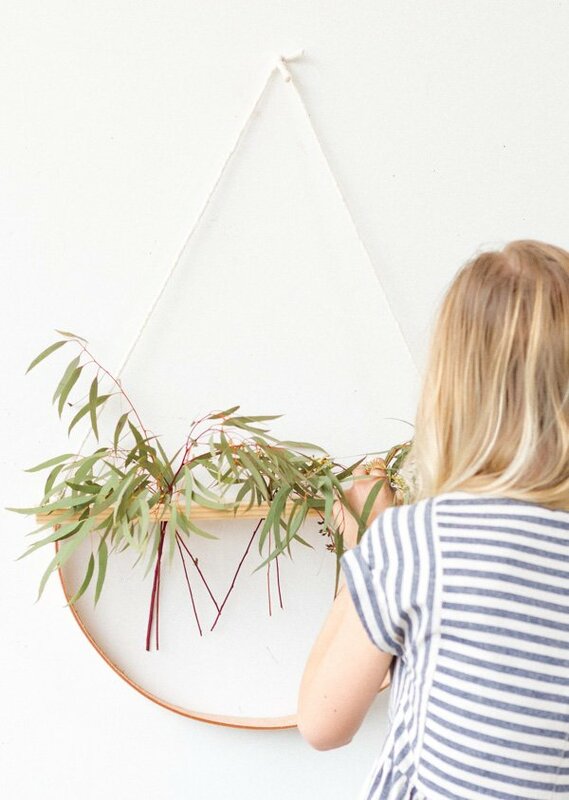 Just add eucalyptus, dried flowers, air plants, etc to the holes and you’re all set. And that’s it! So what do you think? 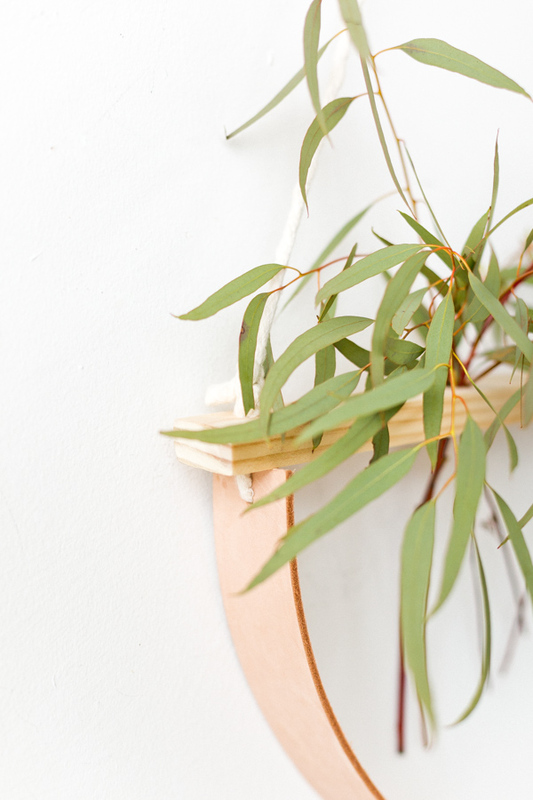 Interested in giving this unique plant holder a try in your home? 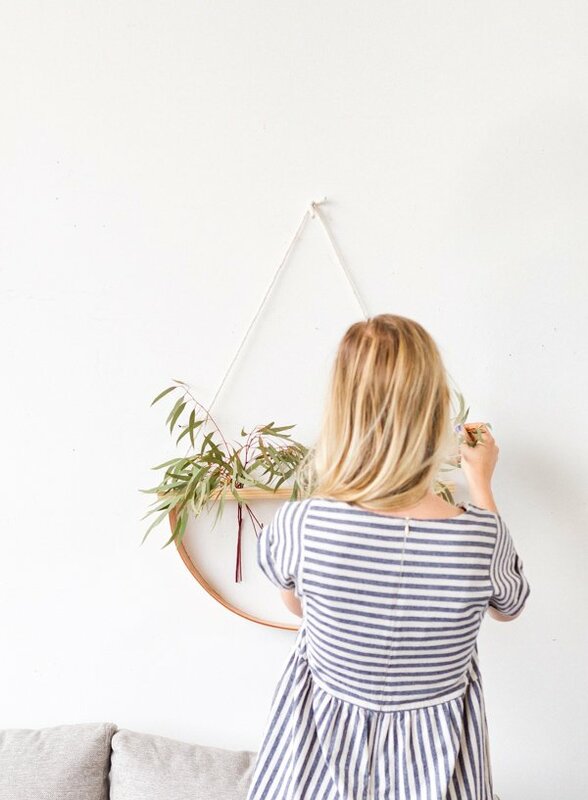 That plant holder is such a cool idea. I never would have thought of it. Thanks Courtney. 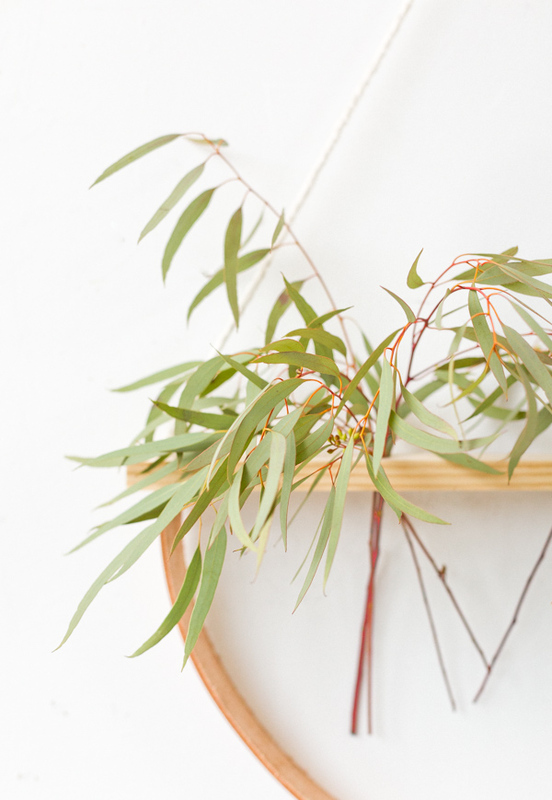 I t was such an easy project and I love using plants / florals that dry out well (like eucalyptus) too because I can leave them be while they’re drying out and it still looks great. This is so effective, love it! I like the thought of adding a coat of clear varnish and using it to hold air plants. All they’ll need is an occasional spritz of water; perfect, low-maintenance plant display! 🙂 – Mike. Good thinking on the clear coat, Mike. That would be a helpful step for anyone to add who wants to be able to spritz the plants with water, etc. Thanks for sharing! How minimalist this is, I love the idea! Thanks Michelle! I appreciate that. 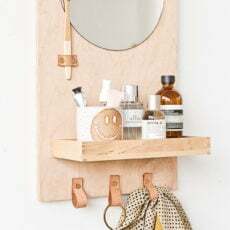 It’s super cool and easy 🙂 Do you think you could use maybe a wider piece of wood and drill bigger holes for glass vials to hold fresh flowers etc.? Thanks for sharing Michelle! Yes Kasia. You could definitely go that route!